The Confectionery products industry comprises of establishments working in the production, distribution, and wholesales of sugar confectionery, chocolate products, and gum products. 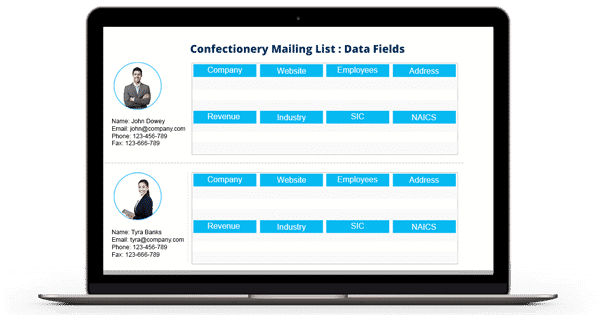 With Confectionery Industry Email List, Blue Mail Media gives you edge over marketers by providing a high-quality database. This database encompasses companies and establishments related to the confectionery industry across the U.S, UK, Canada, APAC, and other regions of the world. We have gathered all the contact details in this database by using credible information from industry-events, business directories, yellow pages, trade shows, and public filings. Confectionery and sugar industry is one among the hot markets in the US and many other regions of the world. If you are a marketer looking to target the establishments engaged in confectionery and sugar industry, Blue Mail Media can provide you the one-stop solution to do it successfully. We offer Sugar and Confectionery Industry Email List – the data resource that consists of contact details from an array of industries involved in the manufacturing, distribution, and wholesale of sugar and confectionery products. We understand that the needs and challenges of every business are different. And thus, one kind of data can never fulfill the purposes of their marketing initiatives. So, we give our clients the luxury of getting their marketing database customized as per the geographic locations, business type, company name, employee name, company revenue, SIC/NAICS codes, and more.